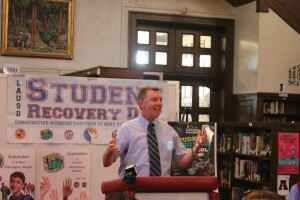 LAUSD Superintendent John Deasy attended a press conference Sept. 14 at Hollywood High School about improving student attendance. Also speaking was school board member Steven Zimmer, and Los Angeles City Councilman Eric Garcetti. Both men represent the Hollywood area. On this day, a group of workers for LAUSD went from house to house and made phone calls to students who have stopped showing up to school without a reason. “We did a total of 83 home visits and recovered 27 students on that day. We also made a total of 168 phone calls,” said Jenny Liu, graduation project counselor. This program offers students a chance to win prizes that are awarded monthly if they attend school. Seniors are eligible for a brand new car. The school district hopes to improve attendance with this program and achieve at least a 96% attendance rate.